The Venturing program, which, in 1998 replaced the portions of the old Explorer program which were not transferred to the Learning for Life organization, originally created a series of awards for Venturers called the Bronze, Gold, and Silver Awards. In May, 2014, a new set of awards were introduced, to replace the Bronze, Gold, and Silver Awards. 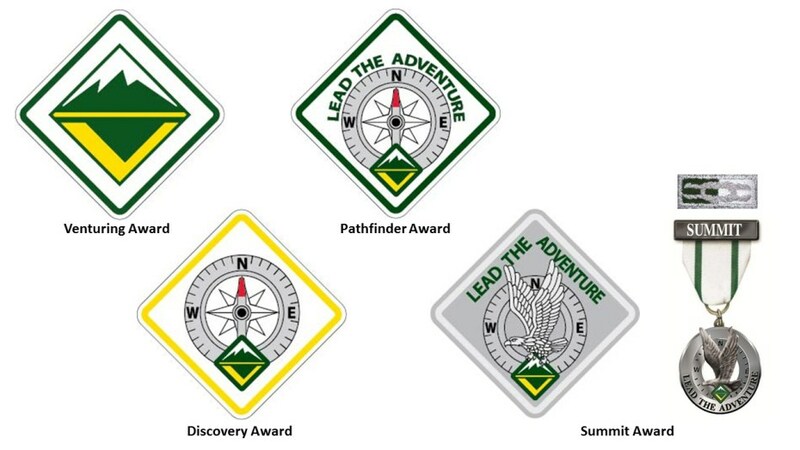 The new awards, are named the Venturing, Discovery, Pathfinder, and Summit Awards. Venturers could continue earning the current (Bronze, Gold, and Silver) awards until December 31, 2014. Beginning in May 2014, Venturers could also convert to the new awards. If they did so, existing Venturers had to begin with the Discovery Award, while new Venturers began with the Venturing Award. All Venturers must now utilize the new awards requirements. As mentioned above, the original program consisted of a series of three awards, the Bronze, Gold, and Silver Awards, which could be earned in sequence by all Venturers, no matter their specialty. The new program has four awards, the Venturing, Discovery, Pathfinder, and Summit Awards. In addition to those awards, Venturers may also earn Specialty Awards, including the Ranger Award, for Outdoor/High Adventure activity, the TRUST Award for Religious Life activities, and the Quest Award, for Fitness and Sports activities. In addition, Leadership Awards, can be earned at the Council, Area/Region, and National levels. Any male Venturer who has achieved the First Class rank as a Boy Scout in a troop or Varsity Scout in a team may continue advancement toward Star, Life and Eagle Scout ranks, and Eagle Palms, up to his 18th birthday. As the Venturer meets requirements for the Star and Life ranks, a board of review will be conducted by the crew committee.